The FTD Happiness Counts Bouquet is set to send joy straight to your special recipient's door with it's sweet style and bright colors! 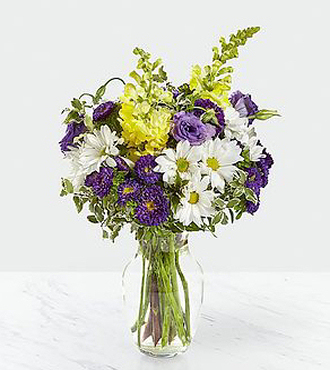 Traditional daisies catch the eye with their brilliant white petals, offset by purple matsumoto asters, purple double lisianthus, yellow snapdragon, and lush greens. Presented in a clear glass vase, this beautiful fresh flower arrangement is created just for you to help you express your thank you, thinking of you, or get well wishes. STANDARD bouquet is approx. 16H x 12W.